LAKE BUENA VISTA, Fla. -- Seven happy lands transport guests to worlds of fantasy, adventure and wonder at Magic Kingdom, the first of four theme parks that comprise the world's No. 1 vacation destination -- Walt Disney World Resort. Nestled on the shores of the picturesque Seven Seas Lagoon, Magic Kingdom opened its gates Oct. 1, 1971, and has created smiles, laughter and fond memories for millions of guests ever since. From the moment they step through its turnstiles, Magic Kingdom guests enter a storybook realm filled with Disney characters at every turn, classic attractions including Pirates of the Caribbean and the Haunted Mansion, and dazzling entertainment such as "Cinderellabration," "SpectroMagic," "Share a Dream Come True" and "Wishes." I know Disneyland is where it all started...but the Magic Kingdom is home for me. It's the first place I go at Disney World, and I don't care how crowded it is. I just HAVE to walk down Main Street and let my heart fill with Disney. The Night of Joy event has been taking place at Magic Kingdom in Walt Disney World for 30 years now! You will see some amazing Christian and Gospel performers. This is a hard ticketed event and well worth the money Here is this year's schedule. Disney is always freshening traditions, and at the same time, they slowly introduce new traditions. There is a new tradition at Magic Kingdom in Walt Disney World. 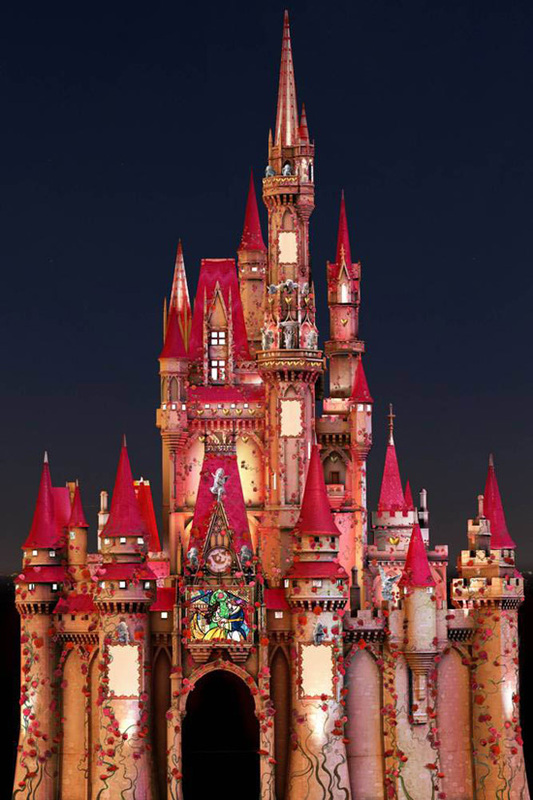 It is a show that you can watch of different images on Cinderella's castle. It takes place every night, and truly is all about Disney magic. New to the show are romantic scenes, like the one pictured above that shows the Castle covered in Roses. In my opinion, probably the best park in Walt Disney World. From the moment you walk through the gate, it hits you: this is a place where magic is real, dreams come true, and you can become a kid again. This park really brings your entire family together to create great, lasting memories to be talked about for years to come. Along with its great rides, this park has awesome dining experiences and many attractions such as the Wishes firework display and the many parades. There is also meeting and greeting the characters who are stationed randomly around the park, which makes great photos. Mickey is located in the judges tent, which you can get to by going through his house in the "Mickeys Toontown Fair" part of the park. Overall, I cannot say enough to express how much I love this park, and I strongly suggest it to all families. Great for kids but not my favorite! I think this park is mainly for the kids; not a great park for the grown ups though. This is undoubtedly the most crowded park on any given day. I highly recommend you come here on an off season day or at least come early in the morning if you can. Go to your favorite ride first and get a fast pass! On the plus side are some great rides here; Splash Mountain is one of our all time faves and Thunder Mountain is great fun too. I enjoy a lot of the classic rides just for old times sake; Pirates, Jungle Cruise, etc. And of course the parades (if you like that sort of thing) are specatacular and the fireworks show is amazing and inspiring. On the minus side, the eating here is not great. I would plan to eat elsewhere if possible because I cant say that any of the restaurants here is in my top ten WDW restaurants.